Are you interesting in working at...? Technische Universität Dresden (TUD) is one of the leading technical higher education institutions in Germany, offering 121 disciplines covering the full academic spectrum spanning from Biomedicine, Bioengineering, Materials sciences, Information technology, Microelectronics, Energy and Environment to Humanities. 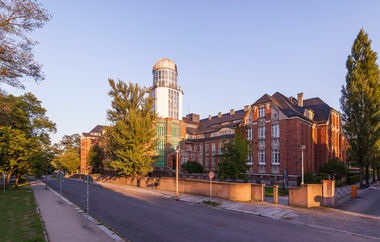 Guided by its motto “Knowledge builds bridges”, TUD is a one of Germany’s hubs of research and science. TUD originated from the Royal Saxon Technical School founded in Dresden in 1828. After more than 100 years of being an essential hub of technical education in Saxony, it gained University status in 1965. Today, TUD is one of the largest technical universities in Germany, with 33,500 students and over 11,300 employees, originating from over 120 different countries. Based in the historically and culturally remarkable capital of the Free State of Saxony – Dresden, TUD combines ancient traditions with pioneering and cutting-edge innovations. Since June 2012, TUD has been one of eleven German Universities of Excellence, an Initiative by the Federal Ministry of Education and Research that aims to promote high-level research in Germany and thus to improve research conditions in the country. Being The Synergetic University with the unique DRESDEN-concept research alliance pooling 27 partners from the world of science and culture, the Clusters of Excellence Center for Advancing Electronics Dresden and Center for Regenerative Therapies Dresden as well as the Graduate School Dresden International Graduate School for Biomedicine and Bioengineering – all of these factors played a crucial role in the university’s recognition as a university of excellence. TUD’s 18 faculties are gathered under the roof of 5 schools, namely the School of Civil and Environmental Engineering, the School of Science, the School of Medicine, the School of Engineering Sciences as well as the School of Humanities and Social Sciences. Furthermore, TUD is a member of numerous renowned organisations, including Silicon Saxony, CESAER-Conference of European Schools for Advanced Engineering Education and Research, TU 9 – Alliance of leading Institutes of Technology in Germany, T.I.M.E. – Top Industrial Managers for Europe and many others. TUD is committed to act in accordance with the principles of environmental protection. Since 2003, Eco-Management and Audit Scheme have been in place at the University, demonstrating the engagement of the institution in environmental protection and recognition of its crucial meaning for sustainable development. TUD is a certified “family-friendly” university. In the Times Higher Education World University Ranking TU Dresden is ranked 155th worldwide.